49 new project cards – These are added to the main deck and function just like the other cards of the deck. However, they introduce some new strategies, most notably the floater strategy. Floater resources represent infrastructure which floats on the thick clouds of Venus. There is nothing special rules-wise with floaters, they work just like animal- and microbe resources, but there are many cards in Venus Next which allows adding floaters to other cards. So there are many exciting combinations to discover. Some cards also feature the new Venus tag, which – again – doesn’t add any new rules, but creates more interesting combinations to play with. 5 new corporation cards – did we mention variety? 5 new corporations means there is a lot of new replayability coming with this expansion. Some of them of course mesh well with the new floater resources and Venus tags, but a couple are also perfect for the base game. An additional milestone and award tile – these are added as a sixth milestone and a 6th award, regardless of if you play the base game map or the Hellas & Elysium expansion maps. Only 3 map be claimed as usual, but there are more to choose from. 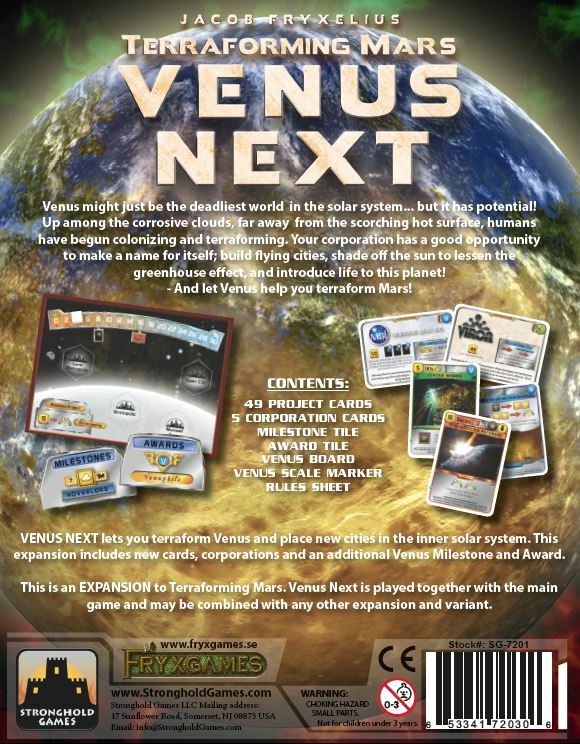 A Venus side board – This is placed beside the main board and features 4 new locations for Venusian, Mercurian, and even Lunar cities. But mainly, it introduces a new terraforming parameter which works exactly like the temperature and oxygen scale of the main game. It represents the overall terraforming of Venus. Increasing the parameter yields 1 Terraform Rating, and there are bonus steps giving additional benefits, just like the other parameters. 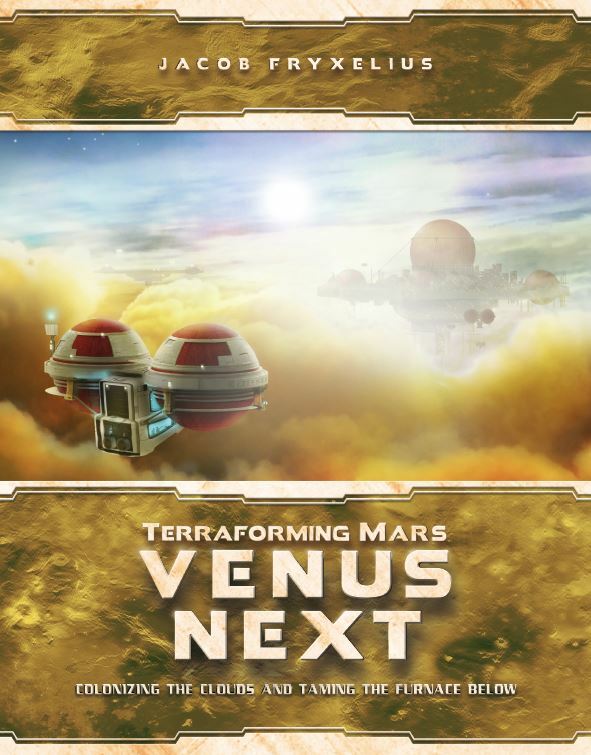 The only difference is that the Venus track doesn’t have to be fulfilled for the game to end. It is an optional source of Terraform Rating. A new game phase – after the production phase, the Solar Phase is introduced. In this phase, the World Government aids the terraforming by having the first player increase any of the 4 terraforming parameters without getting any of the bonuses of that increase. This effectively lets the game take approximately the same play time as with only the base game, but with a lot more variety and more strategies to discover.